Companies doing business in Eastern Europe need information about the recent regional developments in order to prepare strategies for protecting and enforcing their intellectual property rights. PETOSEVIC, providing a full range of IP services in the Balkans and the CIS, will organize webinars with updates and tips for brand owners. 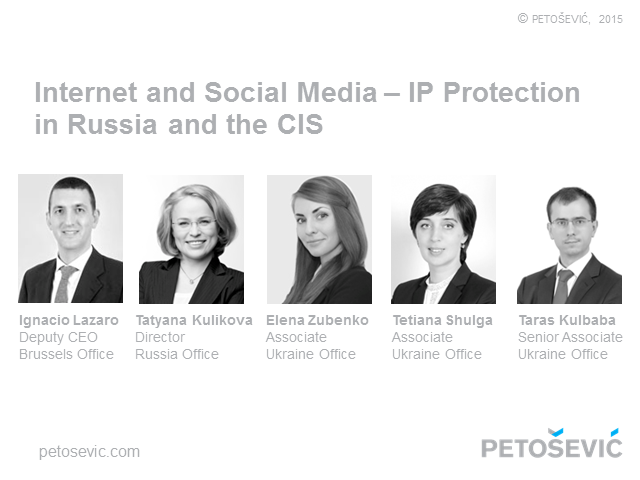 PETOŠEVIĆ will also dedicate its next webinar to the IP protection on the Internet, but this time with a focus on Russia and the former USSR region. The lawyers from our offices in Russia and Ukraine will give a quick overview and share best practices to help you devise effective strategies for protecting trademarks and other IP rights online in Russia, Ukraine, Belarus, Moldova, Uzbekistan and Kazakhstan. Join us for this 50-minute presentation that will be followed by a short question and answer session. Companies doing business in Southeastern Europe need to devise effective strategies for protecting their trademarks and other IP rights online due to the increasing use of the Internet and social media platforms. Our lawyers from Hungary, Bulgaria, Romania, Montenegro and Serbia will share best practices and offer guidance on tackling online IP infringement in the region. The speakers will also discuss the cross-border online IP-related issues and significant cases and developments. Join us for this 50-minute presentation that will be followed by a short question and answer session. PETOŠEVIĆ will dedicate its next webinar to trademark practice and litigation in Eastern Europe and the CIS region. Our lawyers from Ukraine, Romania, Hungary and Croatia will give quick overviews and practical tips on trademark-related issues, significant cases and developments from around the region. They will discuss trademark case law progress, how the legislation is enforced before the courts and to what extent recent cases follow the EU practice and decisions. Join us for this 50-minute presentation that will be followed by a short question and answer session. Countries of Southeast Europe are continuing to develop their customs practice. Changes in regulations, landmark cases, increase in counterfeit goods passing through the borders, training of the customs officers, and for many of these countries, the hope of entering the European Union, are all influencing the changes and developments in the practice. Our lawyers from Slovenia, Serbia, Romania and Bulgaria will give quick and valuable insights into the customs practice of the region and discuss the problems and solutions. Join us for this 45 minute presentation that will be followed by a short question and answer session. This webinar comes as a result of our clients' interest in knowing more about IP protection in the special-status territories of Eastern Europe: Kosovo, Transnistria, Abkhazia and South Ossetia. How to approach the protection of IP in these territories, should brand owners file or not, and where, what are the latest IP updates and tips for IP holders? We will attempt to answer these questions during our webinar. At the end of the webinar, we will also discuss the Customs Union of Belarus, Kazakhstan and Russia. Companies doing business in Southeast Europe will need to prepare for the upcoming changes in trademark practice that will result from Croatia joining the European Union in 2013. Other countries in the region, such as Serbia, Montenegro and the Former Yugoslav Republic of Macedonia, are EU candidate countries and are expected to follow in Croatia's footsteps. How will the EU enlargement affect trademark practice in the region? And what are some practical tips that the EU member Slovenia can share with its neighbors in the region? Join us for this 40min presentation that will be followed by a short question and answer session. Companies doing business in Eastern Europe will need strategies for navigating recent changes in intellectual property laws in Eastern Europe. This webinar will address enforcement strategies in the Balkans and the implications for brands due to the new customs union of Russia, Kazakhstan and Belarus. We will highlight what brand owners need to know and act on regarding the most recent changes in intellectual property laws in the new jurisdictions of Kosovo and Montenegro.